True Wild Life | Barb | Barb are a small sized group of fish that are naturally found in the freshwater rivers and lakes across the southern hemisphere. There are over 2,000 known species of barb in the world inhabiting the frehswater regions of Asia, Africa and South America. The barb fish is often referred to as a freshwater shark, due to the fact that barb are one of the few species of freshwater fish to have rows of teeth in their mouths. Despite their small size, barbs are known to be ferocious hunters and are dominant predators in the world of small fish in their natural environment. Barb do only prey upon the fish that are smaller than them, but also on medium sized fish that can sometimes be double the size of the barb. 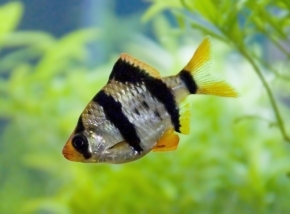 Due to their small size and bright colours barb are commonly kept in household aquariums worldwide. 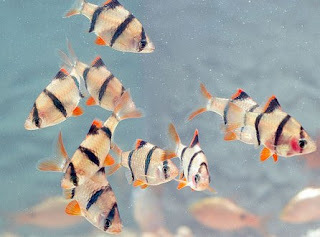 The most common barb kept in aquariums are the cherry barb (pink/red in colour) and the tiger barb (silver body with thick, black stripes and red fin on it's belly) . Barb are known to be relatively hardy fish and can easily adapt to changes in the water including changes in pH levels and temperate. It is known that barbs can successfully inhabit unheated tanks, and although this has proved to be successful in many cases, it is not recommended as barb are naturally found in warmer tropical waters. 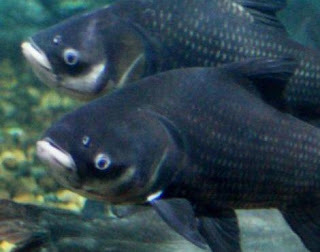 Due to their aggressive and dominant nature, it is not ideal to keep barbs in artificial tanks with smaller species of tropical fish. At the same time, barb will also hunt medium sized fish if there is a lack of food, and so are best kept on their own (just barbs) or with much larger species of fish. Barbs are known to lay numerous eggs in order for a few to hatch successfully. 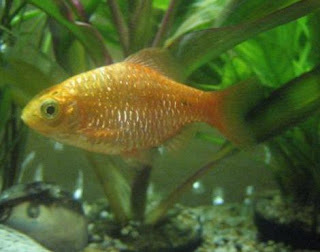 The baby barb are called fry and generally hatch within a few days of being laid. Like their hardy barb parents, the barb fry are able to adapt well to changes in their surroundings.